This whole Boards of Canada thing is starting to get absolutely ridiculous. The other week, they slipped out some mysterious Record Store Day records and then premiered some more mysterious sounds on the radio. Now, fans have been sleuthing extra hard and from the looks of it, it's paid off. FACT points out that the latest clue has become available through some serious nerding out on the Boards of Canada message board. Here's what happened: On their official YouTube page, Boards of Canada moved three Twoism-inspired clips to the top. 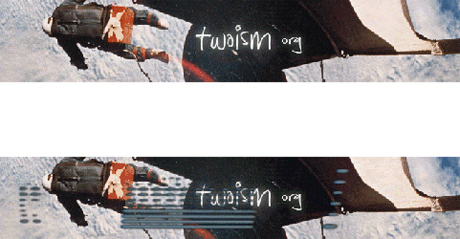 Then, one of the web banners at the Twoism message board had changed from the top image above to the bottom image. A different user quickly opened the .gif of the banner in Notepad, and found a secret code that led to two SoundCloud links (here and here). When played at the same time, the SoundCloud snippets reveal the latest code in the clue chain, making it "—— / 628315 / 717228 / 936557 / —— / 519225." Note that the NPR code has not been placed yet. Many are now concluding that the new Boards of Canada may be called Cosecha. Meanwhile, we're starting to appreciate straightforward press releases more and more each day.